John carves birds in wood, enjoying their shape in the hand, and the coast is vital to him. Living near an estuary at Prestatyn, he favours shore birds. 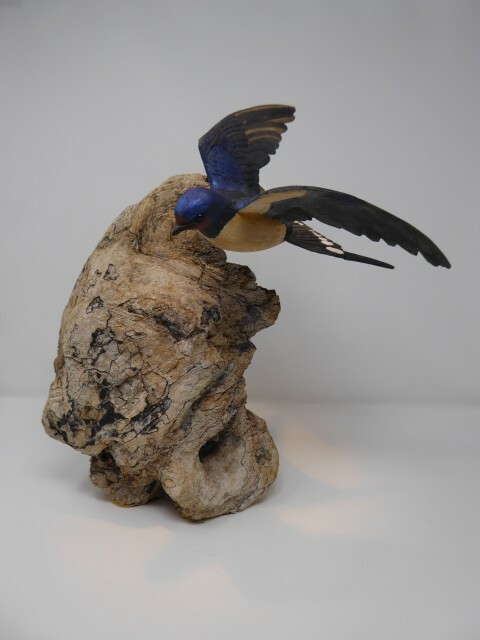 He began woodcarving in 1977 after a year in Michigan where he came into contact with the decoy tradition. During further year-long visits, he worked with carvers in Washington and Utah. In time his wife Marilyn joined him and he has learned to appreciate her use of colours, particularly their muted-ness, her eye for shape and, generally, her role as trusted advisor. A pyrography tool is used to suggest the texture of the feathers, followed by thin washes of acrylic paint. Most are of British birds, resident or of passage, and are carved in lime wood. After texturing and painting, they are mounted on driftwood. These perches are an essential part of the whole piece and John spends many hours searching the Clwyd and Conwy estuaries for them. "I'm fortunate to be working in north Wales, so rich in such varieties of bird life. Malltraeth, home of the inspirational bird artist Charles Tunnicliffe who died in 1979, is a place I visit often. The availability of driftwood for perches is vital too, since shorebirds are my favourites. My wife Marilyn does most of the painting. Stains are sometimes used rather than paints because, when rubbed, they provide gradations of colour. Overall I aim at a balance between realism and woodiness. I prefer using gouges and chisels to power tools, because I like listening to the radio. The rivers of North Wales produce a good selection of driftwood between October and April when I harvest it." John & Marilyn have their first exhibition with us in April 2019.